You have finally decided that you are going to take the plunge (that’s a swimming pool pun!) and build a pool in your backyard. You now come face to face with the toughest part of the pool building process. That is, how do you go about sorting out all those pool builders and picking the right one? What Will The Builder Look After? 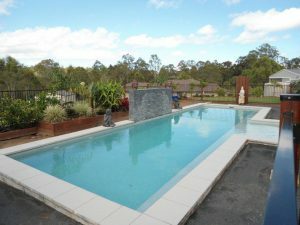 A pool builder will take care of everything related to building your new pool – obtaining the permits, organising excavation, the supply of all the materials related to the pool and of course, building the pool. Ensure that your pool builder is properly qualified, licensed and insured and that they are extremely experienced. Look at examples of their previous work and ask for references where possible. Make sure you sign a contract before any work begins so that you are not surprised by hidden costs. 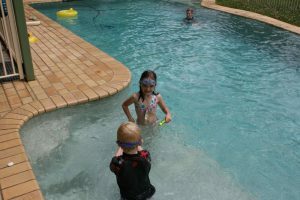 These days, you legally cannot install a pool without the proper safety fencing, and the pool builder will be able to install this for you at the appropriate stage during the pool building. The engineer will take approximately two weeks to do the engineering & draw up the plans for the construction. The council/private certifier will take approximately two weeks to do the property search and check for easements etc & give the approval. Normally there is about a 2 – 4 week waiting period from when the deposit is paid to the start of construction. On day one the excavation will start and usually takes 1 day, following which the pool shape is formed up and steel reinforcing and the initial plumbing is put in place. Then, a special mix of concrete will be sprayed into the walls & floor of the pool & formed to shape. The concrete shell must then be left for about 2 weeks to cure and during that time the secondary plumbing is installed. Once the swimming pool shell is cured, the pool waterline and coping tiles are laid. At about the same time, the fencing can be installed. About 27 days after the swimming pool shell was sprayed, the interior lining (pebblecrete, tiles etc) of your choice is laid. The swimming pool can then be filled with water and chemically treated, making it sparkling clean and ready to swim in. From start of excavation to handover takes approx 6 – 8 weeks.